Umbrellas get a second life « Seed & Sew. 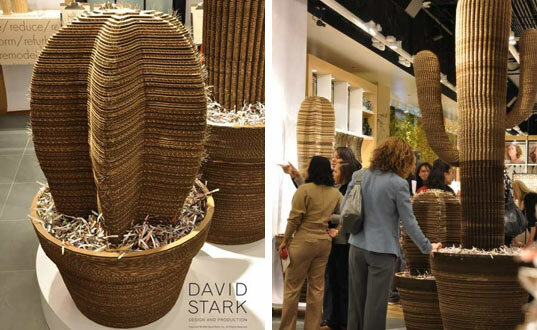 Inhabitat » David Stark’s Incredible Recycled Cardboard Creations. 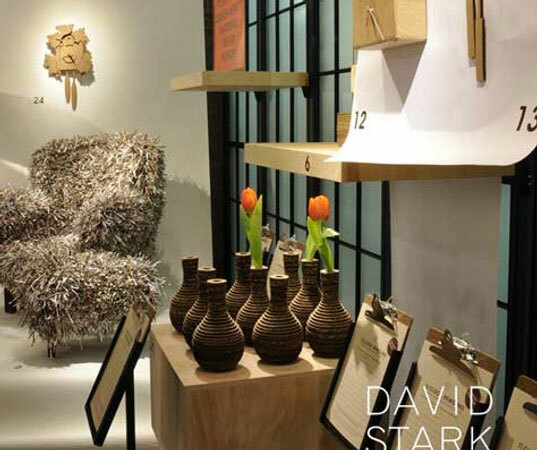 A new West Elm store opened up in Manhattan last week, and the opening gala featured an incredible collection of one-of-a-kind cardboard furnishings crafted by acclaimed designer and event producer David Stark. Constructed from recycled West Elm packaging materials and catalogs, the objects were auctioned off in a silent auction with all the proceeds going to the Cooper Hewitt Museum, a museum devoted to historic and contemporary design. Stark, who has designed events for clients like Rachel Ray, Conde Nast, Target, and Nicole Miller, has lots of experience in forward thinking design. This newest exhibition takes a look at the materials that go into showcasing and shipping West Elm’s products and reuses them. Each item is unique and entirely made from recycled shipping materials. His pom-pom trees and chairs are made from recycled and shredded West Elm catalogs. The clocks, lamps, tableware, and tissue box are all formed from cardboard boxes. The striking vases and cacti statues are all formed from layers of cardboard. It’s all very interesting artistically, but one does have to wonder if the execs at West Elm are rethinking the amount of cardboard they use annually. The event was a success, with reported donations of $8,000 going to the Cooper Hewitt Museum.